Arunachal Pradesh launches 'Arunachal Pradesh Tourist Police' & 'Arunachal Suraksha App' to help the tourists & citizens during emergencies. 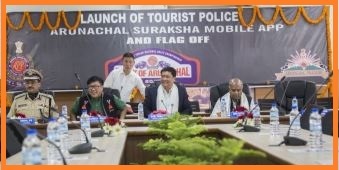 Arunachal Pradesh Chief Minister Pema Khandu launched the Arunachal Pradesh Tourist Police and the Arunachal Suraksha App at a function held at Dorjee Khandu Convention Centre in Itanagar, Arunachal Pradesh. This launch was part of the 46th Raising Day celebration of Arunachal Pradesh Police, which started on 2nd November and will conclude on 8th November 2018. Through Arunachal Suraksha App, users can find the nearest police station and contact details and make a direct call to police by pressing a button. Arunachal Suraksha mobile app is first of its kind for Arunachal Pradesh police. It also has the capacity to send SOS message to emergency contacts. By pressing the ‘Save Me’ button, the user can send a message to the nearest police station.